Stoke Gabriel is well worth a visit at any time of year. In spring it is particularly lovely walking along the edge of Mill Pool. Which is exactly what we did, armed with our trusty Pentax K5 and Lady the collie in attendance as usual. Several flowers would normally be in bloom at this time of year. But being in the midst of the coldest March for many years everything is further behind than normal. 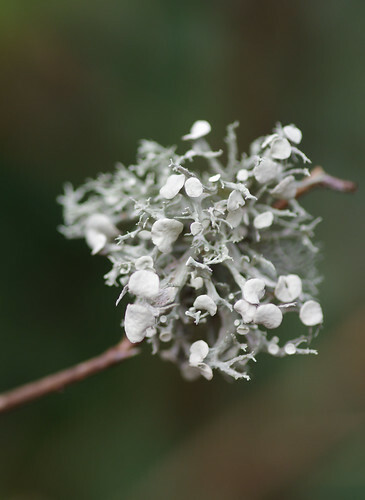 The absence of spring colour has partly been responsible for our continued obsession with lichens. We thought the number of new species might have dried up by now. On the contrary, we keep stumbling across varied miniature forms we haven't encountered before. And when we do see familiar friends there is also the opportunity to improve on images previously attained so that we have a full photographic record of everything we see. We found this on a tree. The lobes are mostly curled upwards at the edges of the lobes. The farinose soredia at the margins of the lobes help distinguish this species from Hypogymnia tubulosa. We turned our attention to some rocks nearby and were fortunate to see an impressive Xanthoria parietina. 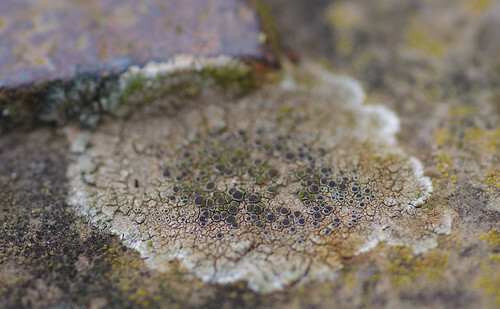 The apothecia of this specimen have been parisitised by the lichenicolous fungi Xanthoriicola physciae. 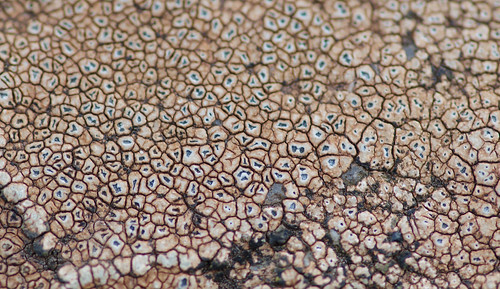 Over time the apothecia will darken and the whole mass could look as if it has been covered in coal. The process is in its early stages. If we go back in a few months I wonder if we will notice a more advanced rate of decay. 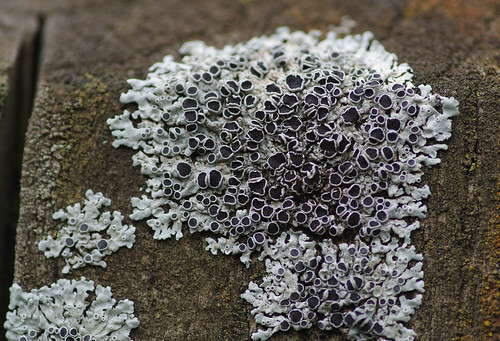 I wonder if there have ever been any examples of a lichen species successfully warding off the fungal attack and actually reversing the process. At first I thought this was another example of Xanthoria parietina. But the lobes are clearly different, being strap-shaped. This might indicate Xanthoria aureola but any species description (however cursory) reveals the apothecia are few and far between, and, in many specimens, absent. 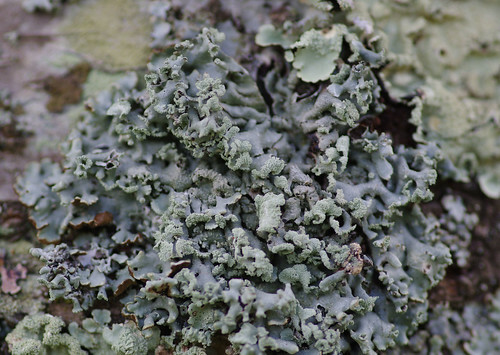 The larger family of Caloplaca lichens has many similar candidates. 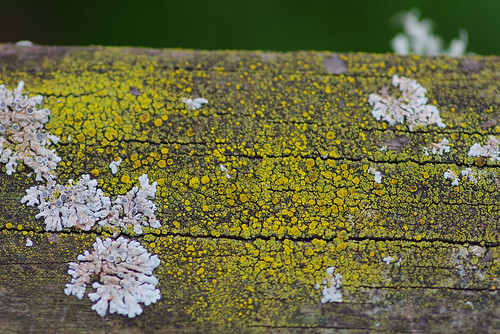 To the left and above the main body of the mystery yellow lichen, you might just be able to detect small clusters of grey discs with white margins (some on the left are slightly pinkish and greenish). These discs belong to another lichen species, Lecanora albescens. Witnessing the changing of the seasons first hand can be invigorating. 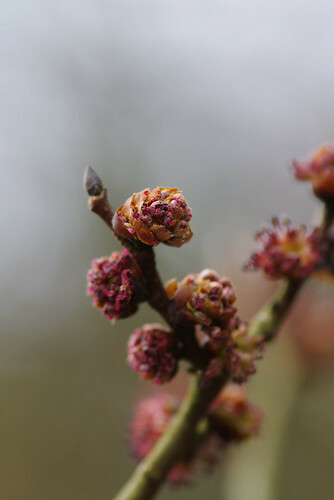 These buds will be flowers soon enough. Maybe then I will be able to identify the tree. And where there are flowers, leaves are sure to follow. 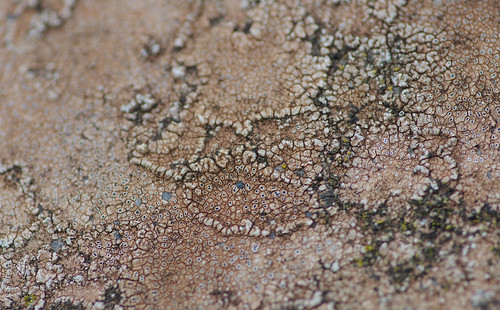 Perhaps we should have had our fill of lichens by this point. But even if you can't put a label on something and manage to arrive at a conclusion, you can always file it under THE ABSTRACT. This one was perched teasingly on the end of a twig. The background colour is unusual, too. 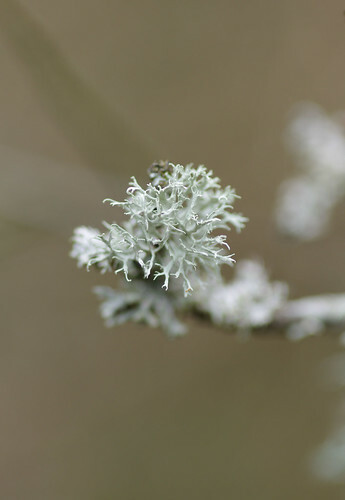 We've also captured a number of Ramalina fastigiata specimens. But I don't think any of them has been as clear as this one. The subject is in focus and the background is in unison. With the macro lens permanently attached to the camera any birds appear minute. But you are able to capture creatures within the context of their environment. The water of Mill Pool was still and we edged past silently so as not to disturb the bird. These were on a rock. 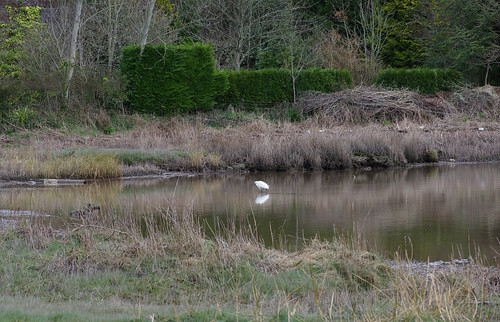 We were probably as immersed in our activity as the egret was while fishing. How far inland do you have to go before coastal species cease? Lecanora helicopsis is a coastal species but then the waters around Stoke Gabriel are tidal. The discs, thallus and prothallus are all an exact visual match. 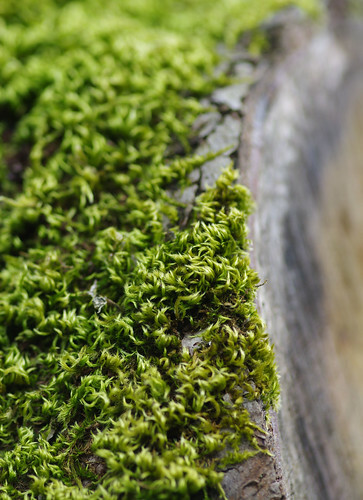 Physcia aipolia is present on this wooden railing. 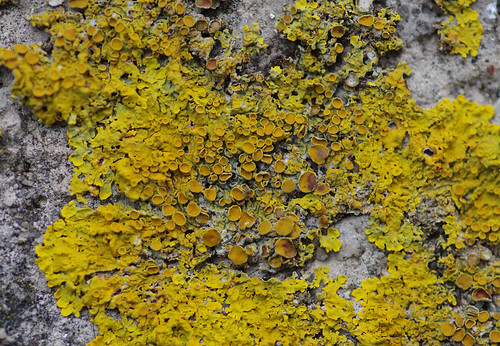 I think the mass of yellow could be Caloplaca citrina but again there are many similar species in the group. This was on a wooden post as we entered the village orchard. It's the best example of this species that we have seen yet. We examined the orchard trees and found this moss. The example above illustrates a specimen 'drying out'. The shoots and leaves do not appear curled up when wet (they are erect, straight and a glossier shade of green). Then we left the orchard behind and approached the churchyard. 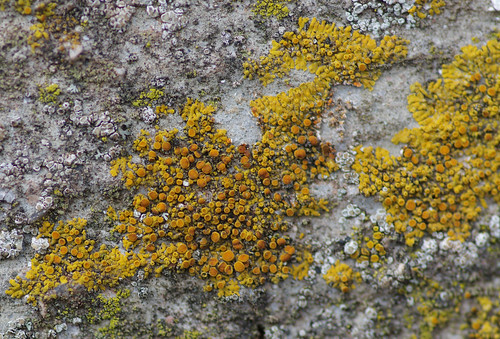 There were a sufficient number of lichen species to be found on headstones and church walls to warrant a separate blog entry.